As I've lamented in the past, Chez Hoppo Bumpo suffers an imbalance between X and Y chromosomes. Opportunities to make clothes for little girls are few and far between. So I had lots of fun making a little playset for a family friend, who turns 5 today. The outfit is made from BurdaStyle's very easy Sophia Little Girl's Playset. I can highly recommend this pattern. Granted, that printing, cutting and taping 19 pages together is a bit of work, but at US$2 its good value. The pattern is multi-sized, giving 92-104-116-128cm. I made up the pattern for a 110cm child, so needed to redraw all the pattern pieces between two sizes. The sewing itself, however, was all very straight forward. If you look at the original design, you'll see that I used a bit of poetic license. The bodice is meant to be cut in one piece, giving seamless shoulders. I didn't have enough of my cute Aunty Cookie fabric for to do this, so instead I cut the top in three pieces. The print was used on the front, with black with white polka dots on the back. I also omitted the little cap sleeves (read: I forgot to cut them out, then decided to make do without). The seams and hems were all finished using some home-made bias binding. After fitting the top on (a hesitant) Argy (rats ... the game is up - he definitely knows the difference between girls and boys clothes) I decided to re-cut the neckline. I made it a bit wider and deeper, so that it would be more comfortable on a hot summer day. Unfortunately, this alteration took out a row of carefully lined-up Cookie girls in the centre front. They all lost their heads. Nasty, that. And one headless soul was condemned to stare from the back as a covered button. Gruesome, huh? it's amazing. I adore that fabric! Why didn't the French think of that? All those separated heads just left to rot, surely they could have had a different purpose? The fabric button is so cute! I like the loop tab you've made around it with the white topstitching. Love your fabric combinations. It's adorable, I bet it will become a favourite outfit for the five year old. The binding and fabric combos are fab! Gorgeous - really gorgeous, one of the best uses of Aunty C fabric I've seen. Did you make the button yourself - looks great - are they easy to do? Golly you are giving me withdrawal symptoms - only one more week and me and my sewing machine will be reunited. That is a stunning little ensemble - lucky girl! I laughed out loud at the image of your son as a clothes dummy! The 19 pages of sticking were definitely worth it in the end. It's just gorgeous, and I love the ruffles on the pants... I wonder if I could get away ruffles at my age? That's a really gorgeous outfit, HB. BTW, love your new header! What an absolutely gorgeous little outfit - the button tops it all off! The little girl's head can be the head of all of the headless cookie girls. It's really cute. You've inspired me to try my hand at making bias tape. Wish me luck. Gorgeous - LOVE the covered button. I'm sure it will be nice for the wee girl to get clothes that aren't pink. I love pink but make a concious effort not to buy my 2yo girl any more pink clothes because we've got a bit of pink overload clotheswise. You can have too much of a good thing! the fabrics are great....I must see if there is a boy cookie version as it would be good for some boys shorts....at least the buttons would be OK for boys. This is adorable...I love the fabric and I love the outcome..well done! brilliant - I love it! The head button is the perfect touch! goody goody gumdrops that is so cute!!! So cute! Loving the headless girls, so funny! Very cute and stylish. Start those Melbourne girls off young, wearing black! (Actually, it's lovely to see something that's not all pink...) You've done a great job. I am so glad you stuck to the sticking and re-drawing of the pattern, that outfit is gorgeous. I bet the lucky little recipient will be completely stoked. Fantastic. Wow that Aunty C fabric looks fantastic in that set! great print and colour combo even for a little girl. Gorgeous outfit. I have bookmarked that from the site before but haven't made it up yet. Love the fabric. Heh, heh! Love it- Well done! This is soooo adorable. 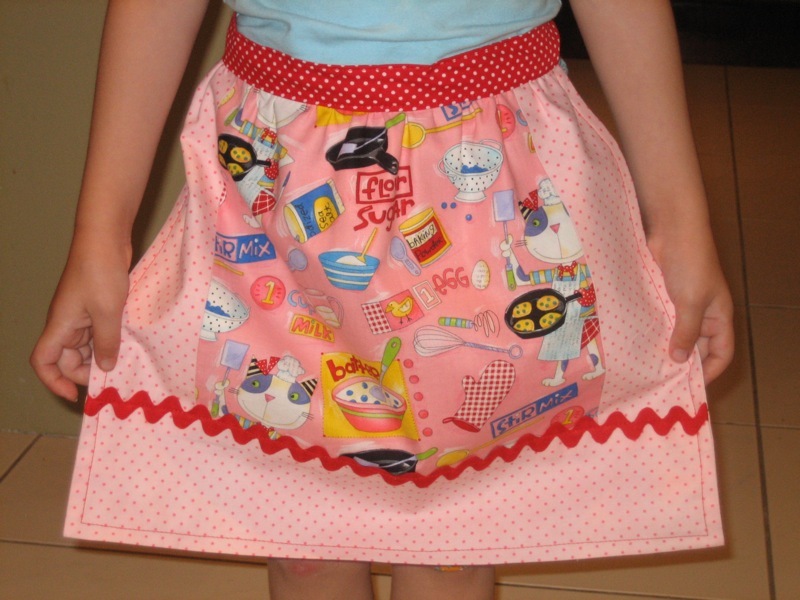 A great use of Aunty Cookie fabric! That is so cute! I love the little face button... not matter how gruesome. I do the same thing.. using my boy to test girl stuff on. He is through with it, though. It was just an apron this last time and BOY was he annoyed with me. I'm gonna have to figure something else out. That's fantastic! Cracking up at poor Argy...so I still have a few years up my sleeve then? Oh MYYY! Gorgeous little playset. Great fabric choices as well. Miss 5 is going to feel like a total princess! that outfit is *to die for* ! !